Another thing that must remain “hot for God” is our gifts. The solution to every difficult situation in this world, then and now, is the gift of God in us in one form or another. The gift of God is within every single believer! Every believer has the gift the Holy Spirit deposited inside of them, and through them the Holy Spirit will display particular gifts according to the way God has made them! The church is the answer to the world’s problems—it’s not the other way around. He has anointed us! The answer to paganism is the gift of evangelism. The answer to wrong doctrine is the gift to rightly divide the Word of truth. The answer to needs is the gift of giving. The answer to discouragement is the gift of encouragement. The answer to condemnation is the gift of mercy. The answer to unbelief is the gift of faith. The answer to disorganization is the gift of administration. The answer to wrong motives is the gift of discernment. The answer to loneliness is the gift of hospitality. The answer to sickness is the gift of healing. The answer to confusion is the gift of wisdom. 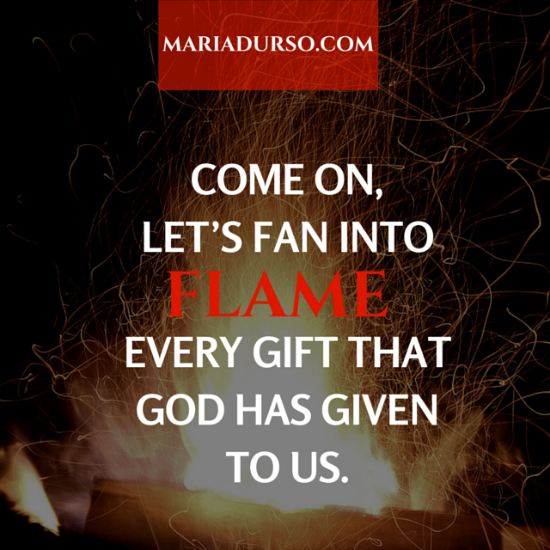 Come on, let’s fan into flame every gift that God has given to us. Let’s not allow anything to put our fire out. No religious people who think they are supposed to be fire extinguishers instead of spiritual pyromaniacs. Don’t allow anything to get you to simmer down. Don’t listen to any lie of the enemy that reminds you of your past and discourages you from fulfilling your future. And most importantly, don’t neglect your fire, allowing devotion to be turned into duty! It has been said that it’s the nature of the fire to automatically go out. Don’t let that happen to you. Tend to the fire in your heart and allow the Holy Spirit to continually breathe on you so that people say, “Wow, she’s hot,” or, “Wow, he’s hot”—and may they mean we are burning hot for God! Come on, it’s time for a brain wash! Lord, set us on fire. Consume us through and through. Set every gift that You have placed in us, gifts that may be lying dormant, to the boiling point. Let us be a bright light set ablaze affecting this dark world. In Jesus’s name, amen.